The Rashtrapati Bhavan houses the first citizen of the country, the President of India. Also known as the President House, Rashtrapati Bhavan is the perfect blend of the good old charm and modern zing. Being the home to the President of the country, Rashtrapati Bhavan truly stands for country’s secular character, its democratic traditions and the overall strength. Besides being a building of national importance, India’s Rashtrapati Bhavan is an exemplary creation of architecture. This H-shaped building was conceptualised by Sir Edwin Lutyens. However, Herbert Baker joined him for giving the architecture of the building a final shape. The palatial building is spread across a 330 acre estate, where only 5 acre is the covered area. Formerly known as Viceroy’s House, the Presidential residence comprises of 340 rooms, that include, president’s official residence, offices, guest rooms and reception halls. The prestigious building also includes huge presidential gardens including the famous Mughal Garden, along with some large open spaces and residences of staff. It was during the Delhi Durbar that happened in 1911, when it was decided that Delhi will replace Kolkata to be the new capital of the country. Subsequently, it was decided that a residence for British Viceroy will also be created in the city. The architects then started working on a plan for establishing a new city, which had to be built towards the south of the old city. During that planning, they came up with the idea of giving an enormous position and size to Viceroy’s house. The British architects had acquired around 4000 acres of land to build this magnanimous structure, which was originally known as Viceroy’s House. Raisina and Malcha villages were relocated to acquire that humongous piece of land by some 300 families, under the Land & Acquisition Act. The primary architectural responsibility of creating this amazing piece of craft was rested on British architect Sir Edwin Landseer Lutyens, who was one of the most important members of the city-planning process. Lutyens created a design that was classical, yet colourful and detailed, inspired by the Indian architecture. Lutyens and Baker started working on the design together, where Baker was to design the two Secretariat Buildings, in front of the Viceroy’s House. However, Lutyens had proposed to build Viceroy’s House on top of the Raisina Hills, with the two Secretariat building placed slightly lower. This became a bone of contention amongst the two architects. After the completion of the building, Lutyens had the argument that the front view of Viceroy’s house was obscured due to the high angle of the road. Lutyens tried convincing the authorities to make the desired change. He, however, could not succeed in his campaign. Lutyens thought that a little lower road with retaining walls on both sides could enhance the look. He also believed that Baker was not focussing on making the building beautiful. Instead, according to him, Baker was more concerned for his money and pleasing the authorities. History states that Lutyens travelled between India and England for about 20 years to build the Viceroy’s house in both the countries. Lutyens also had to struggle with Lord Hardinge to reduce the budget of the building while maintaining its grandeur. He did reduce the building from 13,000,000 cubic feet (370,000 m3) to 8,500,000 cubic feet (240,000 m3) because of the budget constraints. The building was finally ready in the year 1929. When the first Governor General of India C Rajagopalachari, went to live in the palatial house, he used just a few rooms, which are now known as President’s family rooms. However, he converted the other rooms into guest rooms, which are used for the stay of state guests of the country. It was on 26th January 1950 that the building was named as Rashtrapati Bhavan, when Dr Rajendra Prasad became the first President of India. India’s Rashtrapati Bhavan comprises of four floors and 340 rooms in total. The building covers the floor area of around 200,000 sq ft. The constructors of the building have used 1 billion bricks and 3,000,000 cu ft of stone with steel to construct this national pride of India. The building was created during the time period of Edwardian Baroque. During his time, heavy classical motifs were used in the architecture to showcase imperial authority and power. One can witness a lot of such motifs in the President’s house in Delhi. Lutyens, initially, was averse of the idea of incorporating local motifs in his design. He wanted the design to be more classical and European in style. However, after mutiny, there was stress that the building should be designed keeping in mind the local themes, making it more politically contextual. Left with little choice, Lutyens incorporated local Indo-Saracenic motifs in the design. The Indian President’s house is open for public visit as well. So, the next time you plan a tour to Delhi, don’t forget to get a glimpse of this painstakingly made exquisite piece of architecture. The inside of Rashtrapati Bhavan is divided into three parts. Circuit 1: This part covers the main building of the palatial house and its Central Lawn. In this tour, one can take a look of the Forecourt and the premier rooms of the main building. Some of the rooms that one gets to see include the Banquet hall, the Ashok Hall, Durbar Hall, North Drawing Room, Library, Navachar, Long Drawing room, et al. This part of the Rashtrapati Bhavan is open on Thursdays, Fridays, Saturdays and Sundays. Circuit 2: This part comprises of the Rashtrapati Bhavan Museum Complex, also known as RBMC. RBMC has three distinct buildings including The Stables, The Garages and The Clock Tower. The Stables were dedicated to the nation on July 25th, 2014. However, The Garages were inaugurated on July 25th, 2016. The museum showcases some of the most invaluable artefacts, that are an epitome of culture, art, heritage and history. Hence, a must-visit for someone with an eye for unique things in life. This part of the Rashtrapati Bhavan opens on all days except Monday. Circuit 3: This part of the President’s house covers the Mughal and other gardens. Who doesn’t know about the world famous Mughal Gardens and the floral treat that they offer. Besides, there is the Herbal Garden, the Musical Garden, and the Spiritual Garden as well to fascinate the visitors. 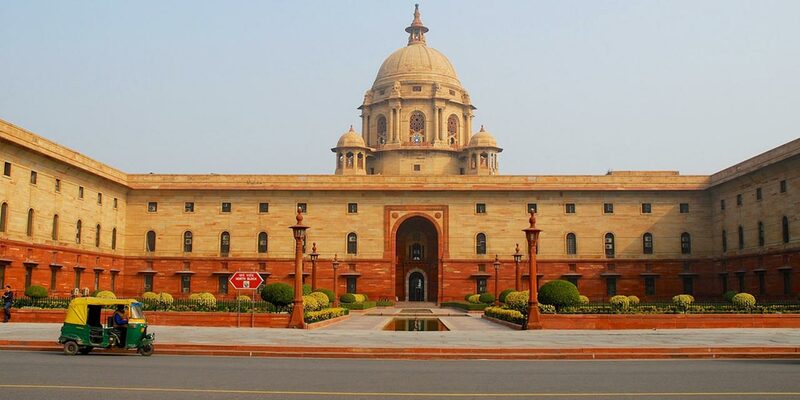 This part of Rashtrapati Bhavan is open from August to March from Thursdays to Sundays. It is a military tradition, that has been revamped over time to make it more visually appealing for the public. It is held on Saturdays and Sundays at the Rashtrapati Bhavan where the valour of President’s Bodyguard personnel, who are excellent paratroopers and tankmen, comes to display. Visitors individually or in a group of less than 30 persons will be charged @ Rs. 50/- per visitor per Circuit. Visitors in a group of 30 persons will be charged Rs. 1200/- (Rs.50 x 30 less 20% discount) per visit. Visitors in a group of more than 30 persons will be charged Rs.1200/- plus Rs.50 per additional visitor. Entry to Rashtrapati Bhavan for visit is through Gate No.2 (Rajpath); Gate No.37 (via Dalhousie Road-Hukmi Mai Marg); and Gate No.38 (via Church Road-Brassy Avenue) of Rashtrapati Bhavan. All Indian visitors are required to carry a valid photo ID proof. Foreigners should make the request to visit along with photocopies of their passport. They must also carry their original passport for verification on the day of visit. By Auto Rickshaw: Delhi has a very well-connected auto rickshaw network. So, take one and reach Rashtrapati Bhavan to witness one of the most exquisite buildings of the world.